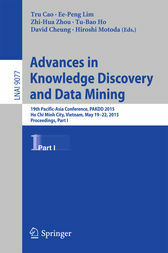 This two-volume set, LNAI 9077 + 9078, constitutes the refereed proceedings of the 19th Pacific-Asia Conference on Advances in Knowledge Discovery and Data Mining, PAKDD 2015, held in Ho Chi Minh City, Vietnam, in May 2015. The proceedings contain 117 paper carefully reviewed and selected from 405 submissions. They have been organized in topical sections named: social networks and social media; classification; machine learning; applications; novel methods and algorithms; opinion mining and sentiment analysis; clustering; outlier and anomaly detection; mining uncertain and imprecise data; mining temporal and spatial data; feature extraction and selection; mining heterogeneous, high-dimensional and sequential data; entity resolution and topic-modeling; itemset and high-performance data mining; and recommendations.